Redesigning Super Mario Bros: Concept Assets! Today, we examine a few of the background bits and goodies and even a look at an upgraded World 1-1! The following are logos for a few of the characters that I thought could help further along the concepts of their designs. Now, as an artist, you're always learning. What I've put into my designs is experience I've gained from my previous work. One day, I can look back at this series and be thankful for what it taught me. That said, in a moment you'll see that I'm pretty much starting at 1-1 when it comes to logos and designs of that nature. Either way, these were pretty fun to do and offered a new kind of challenge. Soon, we'll be looking at the final King Koopa set, so please enjoy this set in the mean time until it's released later this week! Arguably the most popular intro and stage of all time, here's an updated look to the stage as to how I envision it. I had to make it fit for the designs I've created, so I had to balance out a cartoony style with something grounded in realism. Not much is really needed to be said other than I tried to translate what was in the original to what's in this upgrade. Filling in the background was a necessity as was throwing in lush colors that would set the tone for the rest of the stages if I ever tackled a few more. This first logo goes to the Mario brothers! This and the following 2 are what I would imagine be placed on business cards. Maybe I should have outlined them as such? D'oh! Either way, I thought of doing something old-timey, in conjunction with another Mario art I did recently (and haven't shared with you folks yet) and brought it back here. Tackling this business card, I'm not sure if I'm happy with this end result only because the red and green combo makes me think of Christmas. It's a simple and straightforward logo for the brothers. In terms of visuals, I drew up a tunnel for plumbing and place it on the left and then the lightning bolt from Mario Kart on the right to match their respective words but it became a bit too busy. Also, the first part of the lettering was red - I soon changed it to black to be neutral since I felt it was unfair to Luigi! I think this is my favorite logo of the bunch. I didn't spend much on this one - I got down the direction I wanted to take rather early and just soon ran with it. The font I used I believe is associated with western (cowboy western) themes, but I fits really well with the craft at hand. Creating a W out of the tools and adding some colors also came naturally and I think it sits nicely with the logo. Maybe I should go back and do something personalized for the Mario brothers? E. Gadd's business card took a bit longer to do, until I got an "a ha!" moment. I was worried about making it look professional and interesting until I realized that E. Gadd was an older eccentric scientist who would create a business card on his own - why spend money on a graphic designer when he had a computer and printer in his own home? Because Comic Sans has its own history of being misused, I thought it was the perfect way to show someone who knew nothing of art and design. I added the second bit of the logo as a means of throwing some comedy in the mix. Here you have a legitimate cleaning business as the storefront, and a mildly thrown in request to your customers that "while we're dusting around, we can eliminate that paranormal threat that's forced you to go to the psychiatrist cause no one believes you that an entity from the other side has been watching you sleep". Now that Wart's back, I figured he should have his own royal insignia. To be honest, I'm not sure I completely like it, but I still spent time and effort to come up with this. The W I used is round - like Wart, and the blue surrounding the W represents his cape but angular to add some rigidness to the otherwise soft curves of the flesh. The yellow ornaments in the middle are simply flourishes that complete the Phanto mask sitting below the rising lines of the W, which visually mimics the Phanto pendant and chain that Wart wears in his design. The Koopa Korp last week was on full blast as they were the only set of this series that featured so many characters and designs. Topping off at 13 unique soldiers, I felt that King Koopa's private and personal army needed a rebranding to fit into this world I've re-imagined. These characters were all given proper designs to make them look and feel combat ready, and because they were their own group of characters, it felt only right and fair to give them a logo. This one is a bit out there, and I'm pretty proud of the end result. The 2 K's are almost abstract but very visibly noted by the viewer. It has the right amount of edge to it that gives it a tailored look to be placed on the equipment of these band of soldiers. The K/K logo you saw on the original set need to be updated - they were basic and uninspired. This is lively and full of energy. It doesn't seem rigid and rough for a logo for the military, but considering the Koopas in this world are specialists, something a bit more would suffice. The tyrant King Koopa's menacing logo is reserved for only a handful of applications. Armor created for King Koopa and his son, Bowser Jr. feature this logo (and like the Koopa Korp. logo in the original set, Bowser Jr.'s shoulder pad needs to updated with this design) and is also the image used for a stamp of approval for documentation and the like. Naturally, the image is also used for the flags that are carried into battle. And there you have it! I hope you guys enjoy this set before we reach the final set to end the series! More than ever, I'd love to hear critiques on the logos - they're not my strong point because I've never really tackled them in this capacity until now. Thanks all for tuning in! 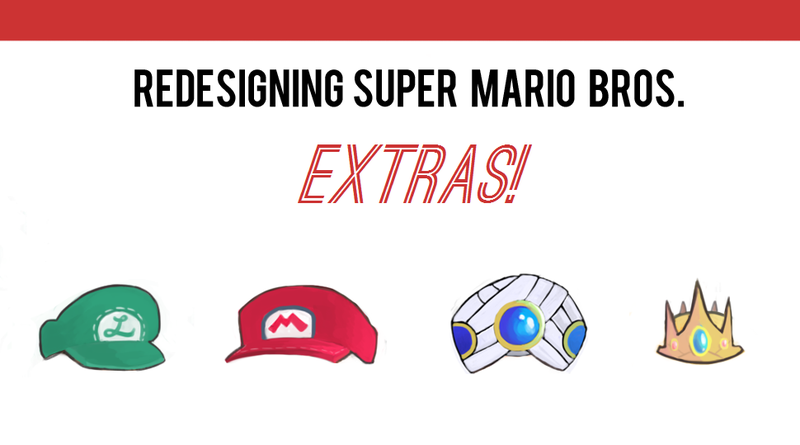 See you soon with the final series of Redesigning Super Mario Bros.!